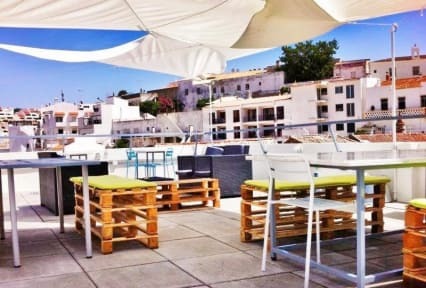 Ale-Hop Albufeira Hostel i Albufeira, Portugal: Reservér nu! In the heart of Albufeira's historical center, the Ale-Hop Albufeira Hostel is within very easy access to all tourist attractions, while featuring very affordable prices as well as providing extreme comfort to its guests. The Ale-Hop Albufeira Hostel is located in a pedestrian area, just a 1 minute walk from the famous Albufeira beach. Just steps away, guests can also find excellent restaurants, shops and the wide selection of bars and clubs this town is known for. Other very useful facilities such as a pharmacy, a supermarket and a ticket shop as well as a currency exchange office are all, literally, seconds away. 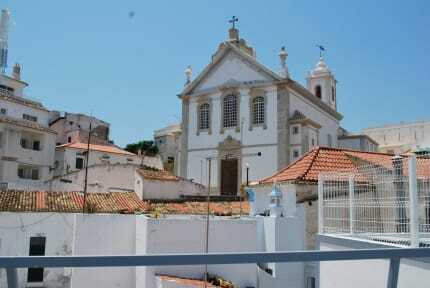 Aside from being surrounded by history, with museums and churches nearby, Ale-Hop Albufeira Hostel is itself set within a historical building, which previously housed the guest house 'Pensao Silva'. In its ground floor you will find the Ale-Hop Shop where, among other things, you can purchase all the beach apparel and souvenirs for your family and friends. In a privileged location, the hostel places its guests right in the heart of the Albufeira 'movida' and a short twenty minute walk from the well-known Albufeira Marina. Should you wish to take a longer trip during your stay at the Ale-Hop Albufeira Hostel, you will find a taxi rank just 3 minutes away and the bus stop is also within easy reach, adding to the comfort of your experience at the hostel. The beach, the wide variety of good restaurants, the shopping, the history and the nightlife are all just a few meters away from this hostel. Here, a car is a luxury you can do without! Ale-Hop Albufeira Hostel offers different types of accommodation, fitting perfectly with each guest's individual needs. Those who value their privacy and would rather have their own space will find 2 double rooms and two triple rooms. If you're the more sociable kind and like to meet new people, fully diving into the hostel spirit, then you will love the 4 dorms at the Ale-Hop Albufeira. Two of the dorms are unisex and sleep up to 8 people in bunk beds. The other two dorms, separate for men and women, sleep up to 6 people, also in bunk beds. All rooms have air conditioning and private bathroom. The Ale-Hop Albufeira has a communal kitchen and lounge, which not only contribute to a more economical stay but also promote interaction among guests. On the top floor, a terrace overlooking the town offers a panoramic view over the historical heart of this famous seaside resort. The Ale-Hop Albufeira Hostel places its guests right where they need to be, where it all happens in Albufeira, setting the ideal conditions for the perfect holiday! Check In from 3.00 pm to 06.00 pm. Check Out from 7.00 am to 12 noon. Great hostel, though a expensive deposit though on 20 euros.